The deadline for speaker submissions has been extended to end of day Friday, March 31. 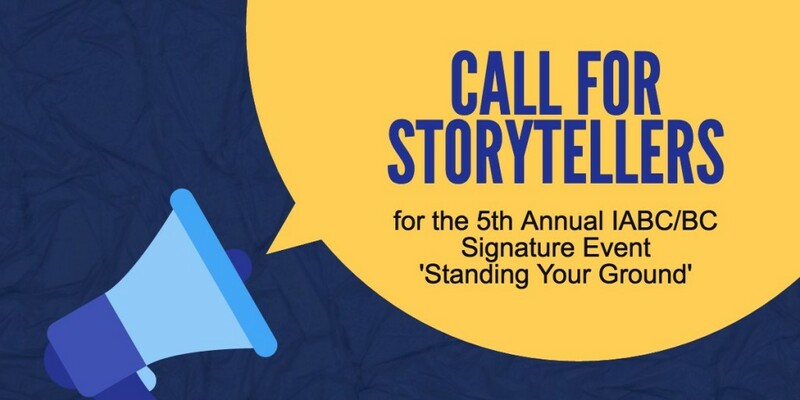 On April 20, 2017 IABC/BC will host its 5th annual signature storytelling event—an inspiring and entertaining evening of communicators sharing their career stories. This year the theme is “standing your ground!” We’re looking for storytellers. In a post truth world of fake news and alternative facts, standing our ground as ethical communicators has never been more important. But we would argue the challenge has always existed. At some point in our career we are the salmon swimming upstream, the courageous communicator who tells the CEO what they don’t want to hear, the honest broker between the media and our organization and the voice of reason. We are the truth tellers. Spiderman’s Uncle Ben said it best “with great power comes great responsibility”. As IABC notes ‘as professional communicators we have the potential to influence economies and affect lives as such, we have significant responsibilities.’ These responsibilities are embodied in IABC’s code of ethics. If you are a local professional communicator and have an authentic five-minute story to tell on how you were a superhero and stood your ground as a professional communicator, we want to hear from you by end of day Friday, March 31 . You must be available to attend the event on Thursday April 20th. Your story can’t be longer than 5 minutes and it must be told not read. Our panel will select 8 speakers. While being an IABC/BC member isn’t a requirement it will be a factor in the selection process. For inspiration, check out our speaker videos from previous events with themes of If I knew then…, Switch Up and How I made my mark. Videos courtesy of IABC/BC video production sponsors Basetwo Media.